For over 100 years one family saw to it that residents in and around Heptonstall received their mail come wind, rain, hail or blizzard! The first Post Office in the village opened in 1849, following a petition drawn up by local worthies and submitted to the Postmaster General. Thomas Uttley was appointed the first Postmaster, the office then being his home, Ivy Cottage. Business was restricted mainly to the sale of stamps; there were no deliveries at that time. After his death in 1851 Mr Uttley was succeeded by his son James (who boasted the extremely unusual Christian name of Plurat!). In addition to running the Post Office James also delivered the mail, collecting it from the White Lion, Hebden Bridge, where it was left by the stage-coach on its way round the region. James round as "postie" was large, to say the least, and he regularly walked 20 to 30 miles a day, covering the area around Popples, Lumb, Jack Bridge, Colden, Reaps, Gorple, Widdop and Alcomden, as well as the whole of Heptonstall village . 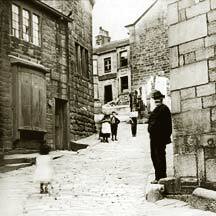 In addition he took the night mail to Hebden Bridge, every day at 7pm prompt. Following the death of his father in 1911 Hiram Uttley was appointed sub-Postmaster following the same arduous round  but with one important concession: he was allowed to use the bus instead of walk up The Buttress! This was, no doubt, a great relief as the mail bag, by this time, must have been heavy indeed. Bill Marsden "walks the walk," following in the footsteps of postmen who covered Mytholmroyd and Cragg Vale, in "The Loneliness of the Long Distance Postie." Luddenden Foot posties sporting their shakos are also shown  as is Bill in his uniform circa 1960! 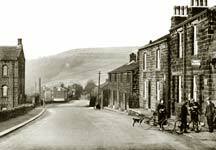 And what was Heptonstall Post Office, along before it became the last shop in the village?